Burn: A Tree Grows in Brooklyn (I didn’t read this until a few years ago so it just doesn’t mean as much to me as these two other childhood favorites). Excited to see your thoughts on these thee books! This entry was posted in Uncategorized and tagged A tree grows in brooklyn, A Wrinkle in Time, Anne of Green Gables, books by Alison Doherty. Bookmark the permalink. You make these too hard for me!!! I know! I feel like I should probably go back to marry date or dump soon … since these are way harder! You do make these hard!!!! 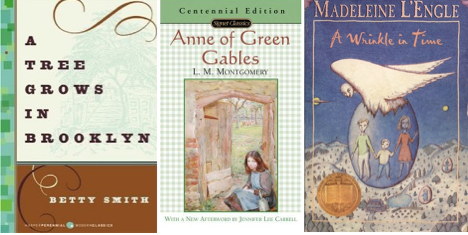 And I miss Marry, Date or Dump…but – to play along I would read Anne of Green Gables every day of the week! I would rewrite A Wrinkle in Time – there are a few parts with Charles Wallace that have always bothered me a bit. Sooooo that leaves A Tree Grows in Brooklyn, which I never really related to – but I think is still a fabulous book!